Grand Hyatt Dubai is home to 682 luxurious rooms including 38 suites, ranging from 39 square meters to 264 square meters. 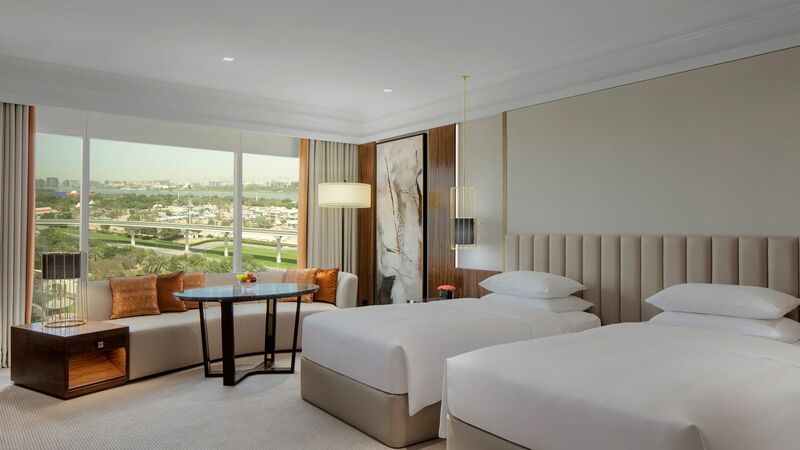 Relax on plush Hyatt Grand Beds™ topped with luxury linens, get creative with our generous work spaces, or gaze at the urban landscape with breathtaking views of Dubai's City Skyline and the historic creek. Whether you're in town for business or leisure, you'll find comfort and convenience the moment you arrive to this city resort. 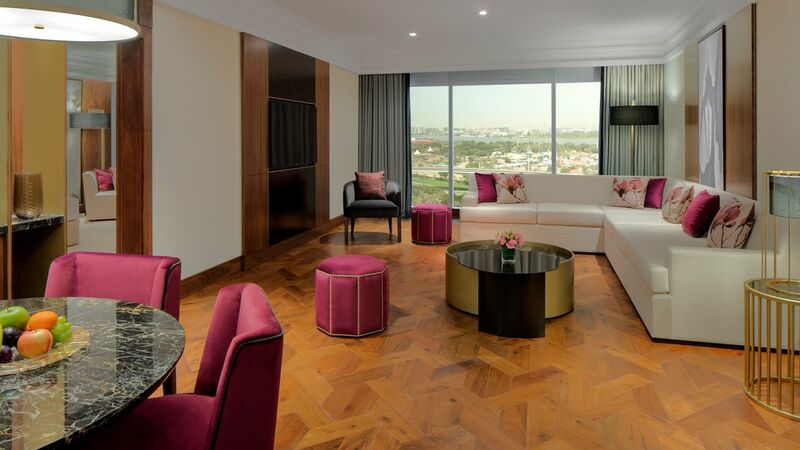 Enjoy an exclusive 132-square-metre suite offering Arabian touches and skyline or creek views. Luxury amenities include king bed, sitting area, kitchenette, large work area with minibar, complimentary high-speed Internet access, guest bath, and marble master bathroom with bathtub, walk-in shower and bidet. This is a premium suite. See World of Hyatt program terms for upgrade eligibility. Relax in a spacious 88-square-metre room offering Arabian touches and stunning views of Dubai's historic creek and parklands. Luxury amenities include one king bed, marble bathroom with bathtub, shower, bidet and work area with minibar, and complimentary high-speed Internet access. This is a standard suite. See World of Hyatt program terms for upgrade eligibility. Panoramic views of Dubai's historic creek welcome you to 176-square-metre upper-floor suite offering bedroom with plush king-size bed, elegant sitting area, kitchen, guest bath, work area with minibar, complimentary high-speed Internet access, and marble bathroom with jetted spa bathtub, shower, bidet and Butler service on request. This is a premium suite. See World of Hyatt program terms for upgrade eligibility. Panoramic views of Dubai's historic creek welcome you to a 264-square-metre two-bedroom suite offering one king and two single beds, spacious parlor, dining for eight, kitchenette, wetbar, work area with minibar, complimentary high-speed Internet access, and marble bathroom with jetted spa bathtub, shower, bidet and Butler service on request. This is a premium suite. See World of Hyatt program terms for upgrade eligibility. Relax in a spacious 66-square-metre room offering Arabian touches and stunning views of Dubai's historic creek and parklands. Luxury amenities include two king beds, marble bathroom with bathtub, shower and bidet and work area with complimentary high-speed Internet access. 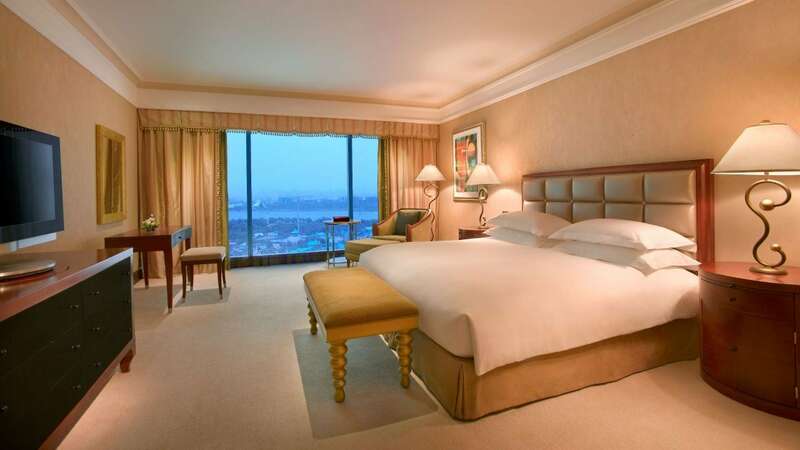 Grand Deluxe rooms are located on floors 1-9. This is a premium suite. See World of Hyatt program terms for upgrade eligibility. 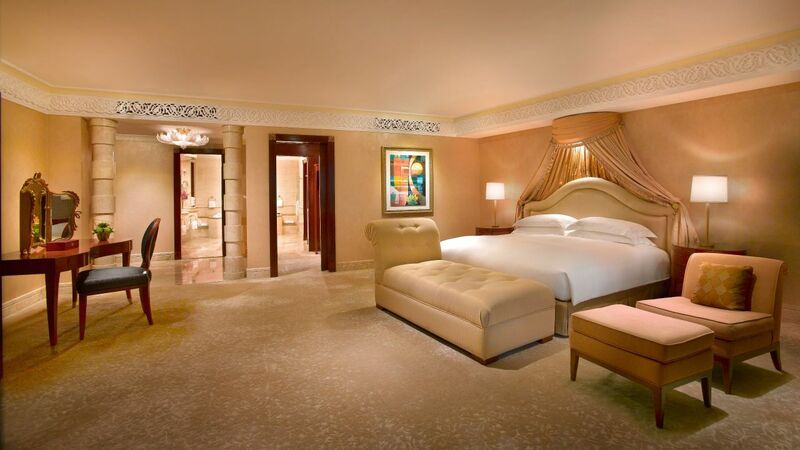 Relax in a 39-square-metre room offering Arabian touches and stunning views of Dubai's skyline. Luxury amenities include one king bed, marble bath with tub, shower and bidet, and work area with complimentary high-speed Internet access. 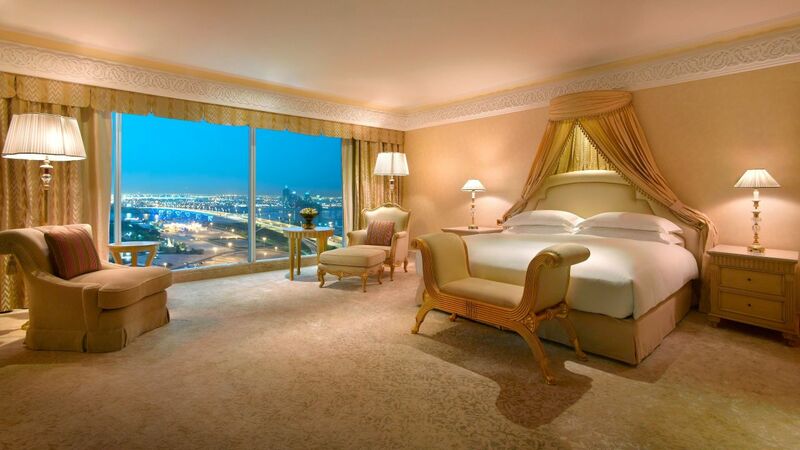 Relax in a 39-square-metre room offering Arabian touches and stunning views of Dubai's skyline. Luxury amenities include two twin beds, marble bath with tub, shower and bidet, and work area with complimentary high-speed Internet access. 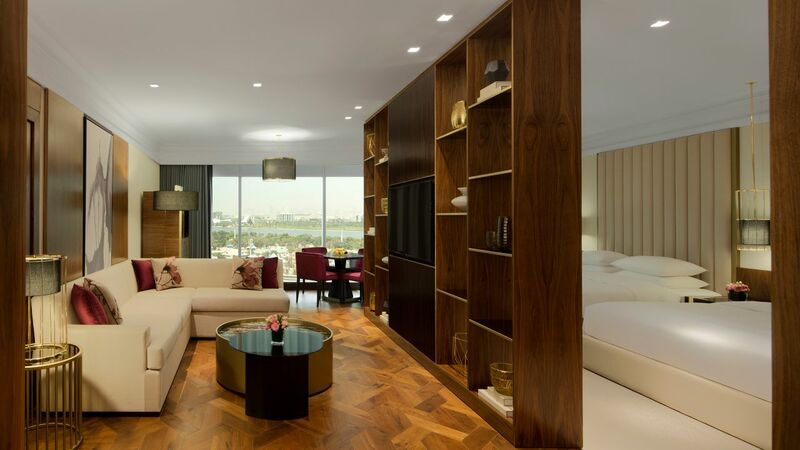 Relax in a 44-square-metre room offering Arabian touches and spectacular views of Dubai's historic creek and parklands. Luxury amenities include king size bed, marble bath with tub, shower and bidet, and work area with complimentary high-speed Internet access. 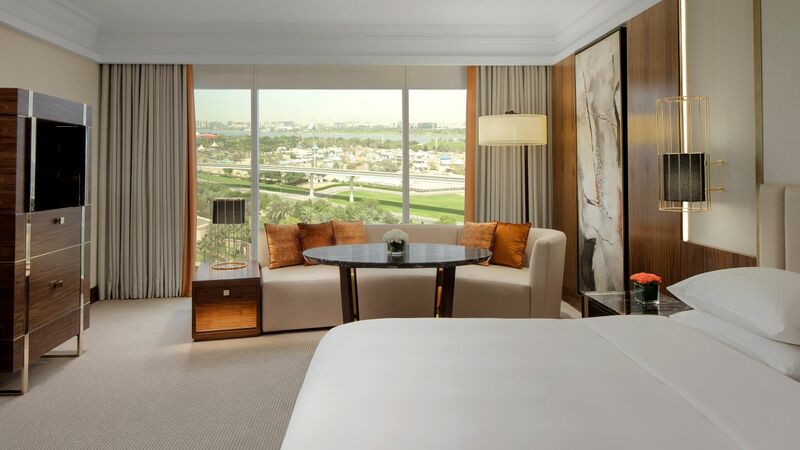 Relax in a 44-square-metre room offering Arabian touches and spectacular views of Dubai's historic creek and parklands. Luxury amenities include two twin size beds, marble bath with tub, shower and bidet, and work area with complimentary high-speed Internet access. Spectacular views of Dubai's historic creek and parklands welcome you to a spacious 44-square-metre room featuring one king-size bed. Modern decor with Arabian flair complements deluxe amenities, including plush robes, marble bathtub, shower and bidet, and generous work area with complimentary high-speed Internet access. Spectacular views of Dubai's historic creek and parklands welcome you to a spacious 44-square-metre room featuring two twin beds. Modern decor with Arabian flair complements deluxe amenities, including plush robes, marble bathtub, shower and bidet, and generous work area with complimentary high-speed Internet access. Stunning views of Dubai's skyline welcome you to a spacious 39-square-metre room offering contemporary decor and classical Arabian touches. Pampering amenities include plush king-size bed with Dorfmueller duvets, generous work area with complimentary high-speed Internet access, stylish Italian bathroom with separate bathtub and shower, twin basins and bidet. Stunning views of Dubai's skyline welcome you to a spacious 39-square-metre room offering contemporary decor and classical Arabian touches. Pampering amenities include two plush twin beds with Dorfmueller duvets, generous work area with complimentary high-speed Internet access, stylish Italian bathroom with separate bathtub and shower, twin basins and bidet.